What is LOVE, Dr. Cookerly? : Loving Others "As" You Love Yourself ??? Love others as you love yourself is considered by many to be one of the world’s greatest teachings. There are several good reasons for this. One reason has been hidden from common awareness and understanding. In fact, in some places and times this reason even has been banned from being taught or even discussed. This reason is that the teaching, love others as you love yourself, can be seen as speaking of a democratic (anti-authoritarian) system where everybody gets to be a winner and no one need be a loser. It works this way. If I love others and not myself I am the loser. If I love myself and not others, others go unloved and are the likely losers. If I love neither myself nor others we are all the less for that. Only if I love you and also myself do we have an ‘I win, you win, nobody loses’ outcome. Let’s look at the word ‘AS’. In English it is a very small, short word. In many languages ‘AS’ is a larger word and commands more attention. Here the word ‘AS’ can be seen relating to several things. ‘I love you as I love me’ can mean I love you at the same time I love me. It also can mean I love you and me to the same degree. It may mean I love you in the same manner or ways I love myself; in this understanding of the great teaching we both get to do healthfully well. This understanding also suggests a system by which we both can grow stronger and become better for the world we live in. The word ‘AS’, therefore, points to a lot of important meaning in the teaching to loving others as you love yourself. What about sacrificial love you may ask? Let me suggest sacrifice is good in emergencies but not so much otherwise. If we have enough time it’s best to figure out how to love self as we love another so no one need be the loser. Think of it this way. If I cut off my right arm for you it makes our next hug poor. Better that I keep both of my arms, exercise them and then for both you and me hugs, and a lot more, will be far better. Unfortunately there is a fair amount of needless self-sacrifice in the world. This is partly because self-sacrifice has been taught as a ‘high holy virtue’. It’s true that sometimes it is, and that kind of sacrifice sometimes represents great loving and important, helpful action but not always. Some people tend to be self-sacrificing about almost everything and much of that is just not healthy nor is it needed. Then there are those who pretend to be self-sacrificing martyrs so as to obtain ‘higher holiness kudos’ and/or guilt leverage for manipulating others. It is a bit complicated to love others while at the same time loving yourself. Consider these ramifications. If you are loving others approximately to the same degree you are loving yourself, and in more or less the same manner, you are keeping things balanced and probably indicating to others you are deserving of good treatment. Know that if you treat yourself sacrificially or in other ways treat yourself poorly you may be teaching others that it’s OK to sacrifice you and treat you poorly. Not only that, you may be unknowingly influencing them to treat nearly everybody that way. You also could be an influence for others learning to needlessly and harmfully sacrifice themselves. When we love others as we love ourselves we model for others an ‘I win, you win’, approach to human interaction and love relationships. Acting to love others while modeling healthy self-love can help others, especially children, learn self-care, self-esteem and self-confidence while influencing them to act in ways that are good for others. It also helps children learn to respect their parents because the parents are modeling self-respect which is a part of healthy self-love. Thus, it is that this seemingly simple teaching has a great many components to contemplate. It may help to know a little history of this teaching or concept. Around 3000 years ago, or so, a Hebrew wisdom-master taught the revolutionary idea “love your neighbor as you love yourself”. The question was asked who is my neighbor? The answer evolved to be – Everyone! It is now understood that anyone you have anything to do with and anyone you may have some effect upon, no matter how remote or small, is your neighbor. This understanding leads to the concept ‘our village is our planet, and our neighbors are the life forms that live with us on it’. In the future, who knows, it may even reach out to include our solar system and far beyond. About 2000 years ago the man called Jesus (in English) took this teaching and made it one of only two Commandments he ever pronounced. These two commandments, according to many theologians, are what Christianity is founded upon. In effect ‘love others as you love yourself’ is one half of the constitutional law of Christianity. Sadly the ‘as you love yourself’ part mostly either has been ignored, purposefully avoided, downplayed, or given a de-powering interpretation. It often also has been replaced by teachings like ‘put yourself last’ and ‘all self-love is selfish and evil’. 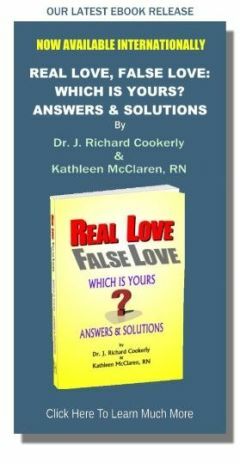 From a psychotherapist’s point of view these anti-self-love teachings have been disastrous for the mental health of many. Put yourself last and see self-love as evil promotes the development of low self esteem, low self-confidence, taking poor or bad care of yourself and becoming in character weak, subservient, submissive, and vulnerable to users and abusers. Furthermore, these anti-self-love teachings influence us toward feeling guilty for honest and accurate pride in doing things well and in our own intrinsic worth; they actually are counter teachings to “as you love yourself”. You may ask how did this come to be? Some think that authoritarian religionists under the influence of monarchists and royalists promoted the de-emphasizing of the ‘as you love yourself’ part of this second great Commandment. Probably because it was seen that the ‘love yourself’ concept points to self strengthening and, thus, to dangerous, independent, self-directed living which, when carried far enough, can result in anti-monarchy democracy. That could threatened the social advantages and control of both the religious and royal masters of pre-democratic times. With these corruptions the teaching became something like ‘be good to others but not to yourself’ because that is the devil’s way which is sinful, selfish, uppity and against God’ unless, of course, you are high born or called to high religious orders. Still today among some who have and want authoritarian power the ‘as you love yourself’ idea is seen as a threat to be de-emphasized or ignored. On a personal level today many still suffer from the concept that their okayness is granted by others (parents, a man, a woman, what others think of them, etc.) instead of by their own evaluation of their intrinsic value, accomplishments, character, etc. With that background in mind some questions are in order. How will you deal with the idea of loving others while at the same time, and to the same degree, and in the same manner you work to love yourself ? Are you willing to do some work to healthfully love yourself so that you can healthfully love others better? If you have strong anti love of yourself programs in your head what will you do about those? If when acting to healthfully love yourself and be good to yourself you feel conflict, guilt, shame or any other bad feeling who might you go to for help? What can you actually do to balance loving others better and more as you also healthfully love yourself better and more? How might you go about studying new, different and better ways to love others and new, different and better ways to love yourself? ♥ Love Success Question If soon you were going to do an act of healthy self-love and a very similar act to show love to a chosen, special ‘other’ what exactly would you do, and when would you do it? 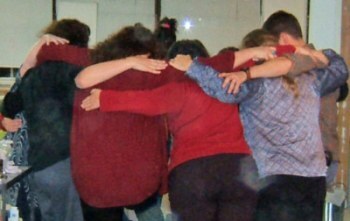 Image credits: “Group Hug” image by Flickr user ms.Tea (Tracy Ducasse).